For over 20 years we have specialized in family fun and memories. 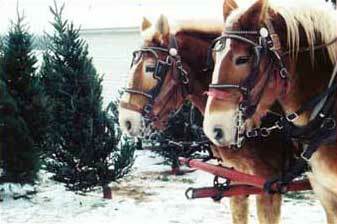 Ride the horse drawn wagon in search of the perfect tree. 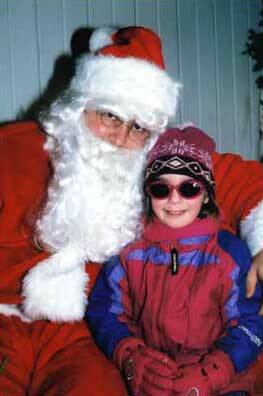 Then warm up in the new Gift Shop and enjoy a free cup of hot apple cider while the kids visit with Santa. Or just spend the day wandering the many trails through the woods and around the ponds. Open daily 9 am-5 pm weekend before Thanksgiving to Christmas Eve. Handmade balsam, fraser & flocked wreaths - 15", 24", 36", 48", 60", crosses & candy canes. Prices range from $10 - $55. Custom decorated wreaths also available. 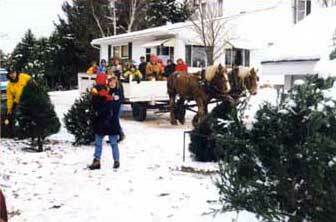 Tree Prices: Red Pine - $3.50/foot; White & Scotch Pine - $4.50/foot; Spruce, Balsam, Fraser, Concolor - $6.50/foot Sales Tax included in Price. Free Horse drawn wagon. 10:30 am -4 pm Fri, Sat, Sun after Thanksgiving and the following 2 weekends.